Portland, OR (April 17, 2006) - "Remember Me" Rose Garden, a nonprofit organization dedicated to creating rose gardens as living tributes to the victims of September 11, 2001, announces "Forty Heroes", a golden yellow rose named in honor of the crew and passengers of United Flight 93. Together the passengers and crew of Flight 93 became heroes who took action in defense of our country, thwarting a planned attack on our nation's capital and saving countless lives. "Forty Heroes" will be the first rose planted in the "Remember Me" Rose Garden rose test plot at Moore Playground in East Harlem (corner of East Madison Avenue and 130th and 131st Streets), a space generously provided by New York Parks & Recreation Department. The introduction and planting of "Forty Heroes" is scheduled for Thursday, April 27 at 10 a.m. as part of the NYC GROWS celebration of National Garden Month®. Those taking part in the planting include Flight 93 family members; Lt. Bob Jackson of FDNY; Sue Casey and Michael Mitchell of "Remember Me" Rose Garden; and Tony Vargo, Vice President and CFO of the National Gardening Association. 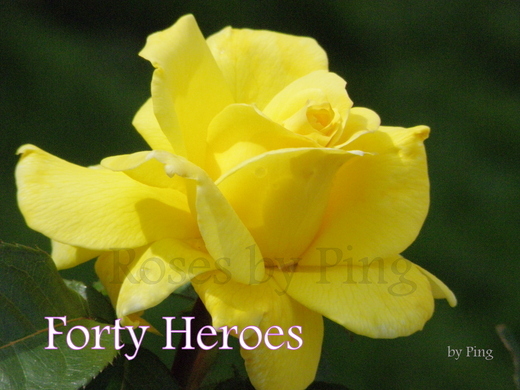 "Forty Heroes" was hybridized by Ping Lim of Bailey Nurseries, Inc., and will be available at retail garden centers in 2008. To learn more visit www.baileynurseries.com.